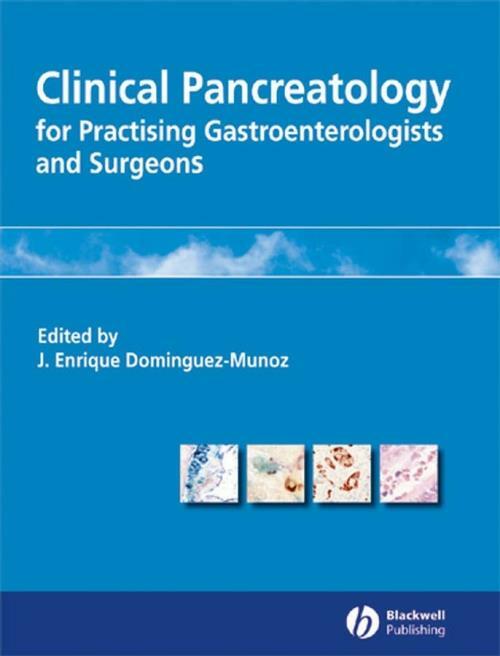 The books and journals currently available in the field of clinical pancreatology are directed at pancreatologists and much of the information does not reach most general clinicians and surgeons who treat patients suffering from pancreatic diseases. This book provides practicing gastroenterologists and surgeons with clear information regarding the diagnosis and treatment of pancreatic diseases. A list of recommended reading included at the each of each chapter. 1. Acute pancreatitis: Definition and classification for clinical practice. 2. Pathogenesis: How does acute pancreatitis develop?. 3. Pathophysiology of acute pancreatitis: which events are clinically relevant?. 4. How should acute pancreatitis be diagnosed in clinical practice?. 5. Guidelines for the detection of the etiologic factor of acute pancreatitis. 6. Early prognostic evaluation of acute pancreatitis: why and how should severity be predicted?. 7. Role of imaging methods in acute pancreatitis: diagnosis, staging, and detection of complications. 8. Basis of therapy in acute pancreatitis. 9. Guidelines for the treatment of pain in acute pancreatitis. 10. Nutrition in the acute phase of pancreatitis: why, when, how and how long?. 11. Antibiotic prophylaxis for acute pancreatitis in clinical practice: rationale, indications and protocols for clinical practice. 12. Modulation of the inflammatory response in acute pancreatitis: what can be expected?. 13. Early endoscopic sphincterotomy in acute pancreatitis: is it indicated, advisable, not indicated or contraindicated? A proposal for clinical practice. 14. Indications for surgery in acute pancreatitis. 15. Surgical approaches to acute necrotizing pancreatitis. 16. Management of acute pancreatic pseudocyst: when to observe, when and how to drain?. 17. Therapeutic approach to pancreatic abscess. 18. Is there a place for laparoscopic surgery in the management of acute pancreatitis?. 19. What should be done to prevent relapses of acute pancreatitis?. 20. Treatment of acute pancreatitis in clinical practice: a global view. Part II: Chronic pancreatitis and cystic fibrosis . 21. Chronic pancreatitis: definition and classification for clinical practice. 22. Epidemiology of chronic pancreatitis: an infrequent disease or an infrequently diagnosed disease?. 23. Etiopathogenesis of chronic pancreatitis: a genetic disease with some precipitating factors?. 24. Pathophysiology of chronic pancreatitis. 25. What is clinically relevant about the genetics of cystic fibrosis?. 26. How does alcohol damage the pancreas?. 27. Why is chronic pancreatitis so difficult to be detect? Key clinical aspects for an early diagnosis. 28. Role of imaging methods in diagnosing, staging and detecting complications of chronic pancreatitis in clinical practice: should MRCP and MRI replace ERCP and CT?. 29. The place of endoscopic ultrasound in the diagnosis of chronic pancreatitis. 30. Should histology and/or cytology be the gold standard for the diagnosis of chronic pancreatitis in clinical practice?. 31. Pancreatic function tests for diagnosis and staging of chronic pancreatitis, cystic fibrosis and exocrine pancreatic insufficiency of other etiologies: which tests are necessary and how should they be performed in clinical routine?. 32. Follow–up of patients with chronic pancreatitis: what to do and which complications can be expected?. 33. Conservative treatment of pain in chronic pancreatitis: guidelines for clinical routine. 34. Endoscopic treatment of pain in chronic pancreatitis: really useful or only feasible?. 35. Management of maldigestion in chronic pancreatitis: a practical protocol. 36. Management of maldigestion in cystic fibrosis: tricks for an adequate outcome. 37. Management of exocrine pancreatic insufficiency associated with other clinical conditions: gastrointestinal surgery, diabetes mellitus, AIDS. 38. Indications and timing of surgery in chronic pancreatitis. 39. Surgical approaches to chronic pancreatitis: technical implications and outcome. 40. Management of chronic pancreatic pseudocyst: when to observe, when and how to drain?. Part III Pancreatic cancer . 41. What is the epidemiologic impact of pancreatic cancer?. 42. Molecular basis of pancreatic carcinogenesis: which concepts may be clinically relevant?. 43. Genetic basis of pancreatic carcinogenesis: which concepts may be clinically relevant?. 44. Clinical assessment of pancreatic cancer: is there a chance for early diagnosis?. 45. What can be expected from tumor markers in pancreatic cancer?. 46. Stage classification of pancreatic cancer. 47. Imaging diagnosis and staging of pancreatic cancer: which methods are essential?. 48. The role of endoscopic ultrasound in the diagnosis and assessment of resectability of pancreatic cancer. 49. Pancreatic cancer: Do we need tissue diagnosis in order to proceed with resection?. 50. Staging laparoscopy and peritoneal cytology in pancreatic cancer. 51. Management of pain in pancreatic cancer: an algorithm for clinical routine. 52. What is the optimal surgical treatment for resectable pancreatic cancer?. 53. Adjuvant and neoadjuvant treatment of resectable pancreatic cancer: what is worthwhile attempting?. 54. The role of endoscopy in the management of unresectable pancreatic cancer. 55. Palliative chemotherapy and/or radiotherapy for pancreatic cancer: what can be expected?. 56. Novel treatments and gene therapy in pancreatic cancer. Part IV: Cystic tumors of the pancreas . 57. Specturm and classification of cystic tumors of the pancreas. 58. Diagnosis and differential diagnosis of pancreatic cystic tumors. 59. The role of endoscopic ultrasonography in the diagnosis and management of cystic tumors of the pancreas. 60. Therapeutic approach to cystic tumors.